When my husband and I were younger, our vacations mostly centered around family fun, with some R&R wrapped in. Now in our mid-60s with a more flexible work schedule, we look at our getaways in a different way. We talk about traveling rather than going on a vacation, and seek out unfamiliar destinations that offer opportunities to be outside and physically active, with time to explore museums and other cultural settings. Nature + Physical Activity + Culture = Adventure Travel, according to the Adventure Travel Trade Association, and boomers are leading the pack. The association’s latest “industry snapshot” found that the largest group of adventure travel tour operator clients (40%) are between the ages of 50-70. And since lots of boomers like to do their own thing rather than join a tour, the number is likely to be higher. The most in-demand adventure activities mentioned were ecotourism, cultural, environmentally sustainable, hiking, and culinary. Also popular for specific regions were cycling and safari activities. Adventure tour operators say destinations receiving interest from adventure travelers are Scandinavia, South America, Southern Africa and the Mediterranean. Today’s adventure travelers want experiences that focus on the natural environment, learning and meaningful experiences rather than risk. Whether it’s sailing or going on a safari, travel companies are responding to the growing appetite of boomers who want adventure getaways, according to The Wall Street Journal. ROW Adventures features lots of water-related trips and other physical activities from A (Alaska) to Z (Zimbabwe). For many of us, climbing on a bike was our first foray into the world of adventure. Now, many of us have returned to biking for fitness, fun and, yes, adventure. Between 1995 and 2009, the rise in biking among people ages 60-79 accounted for 37% of the total nationwide increase in bike trips, People for Bikes writes. The not-for-profit Road Scholar offers 42 trips that center around biking. Choose from a 6-day bike trip to historic battlefields in Virginia or a 12-day “wine” through the Riesling vineyards along the Rhine. The activity level of each trip is rated from 1 (easy) to 5 (challenging). Or consider either a 5-day or 12-day multisport (biking, hiking, walking) trip to Ecuador. Closer to home is the annual Bon Ton Roulet, a 7-day bicycle tour through New York’s Finger Lakes. Bikers choose between a long route (65-75 miles daily) or a shorter one (50 miles), with camping, breakfast, dinner and SAG (“Support and Gear”) transport provided. “Looking over all of these articles since my first appeared here on February 9, 2010, I realize that one theme keeps showing up: Adventure travel is simply good for you. So I’ve compiled a Top Ten list of the reasons why,” writes nature-travel writer Candice Gaukel Andrews. Outdoor activities can prevent (or treat) a wide range of health problems. Doctors are now handing out “park prescriptions” for conditions ranging from heart disease to obesity to attention deficit disorder. Take a hike, get a bigger brain. Research indicates that hiking or walking grows brains and helps keep you mentally sharp. Going on adventures raises your tolerance for uncertainty. Placing yourself in situations where things don’t always go as planned helps you learn to cope with the uncertainties in life. What about you? 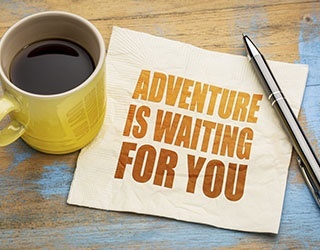 We’d love to hear how your adventure travel experiences have enhanced your life. Want to learn more about Kendal at Oberlin and its travel committee, which is part of the community’s resident-led lifestyle? Call 800-548-9469 or 440-775-0094 or contact us online.